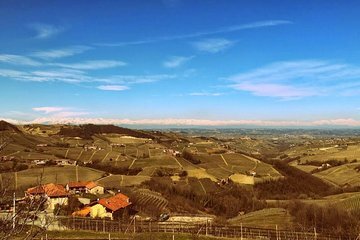 Upptäck de berömda smakerna i Piemonte vinregionen, hedrad som en världsarv och namngivna en topp tio vinresenemål av "Vin entusiast". Besök flera lokala vingårdar för att smaka på regionala sorters varianter som barolo, moscato och brachetto, åtföljd av hantverkskonserver och salami. En gourmetguide kommer att träffas på tågstationen Turin, Alba, Bra eller Asti och presentera dig för de bästa regionala vinproducenterna för en minnesvärd och utsökt dag. The tour went fantastic. It was really nice and everyone was really knowledgeable and personable. Davide at the tour agency made sure everything went smoothly and that we were taken care of. Highly recommend!! Thank you for such a well organized and lovely tour. FANTASTIC TIME!!!! The coordinator David Braye was great with confirming and checking back with us to make sure we had all of the information for the tour. As promised our driver for the day arrived at our hotel and was in fact early! George was a great driver very friendly gave us food recommendations and told us alot of history about Turin and the wine region we were traveling to. We arrived at the first vineyard and were greeted with an amazing view overlooking the vineyard. AMAZING!!! The wine cellar tour was very informative and the wine was great!!! I purchased several bottles of wine. The second winery was great. We basically had lunch along with the wine tasting which was great! I think it was a total of 5 courses with a wine paired for each course. Outstanding service! This tour was amazing. I loved every minute and would definitely recommend if you are in Turin.